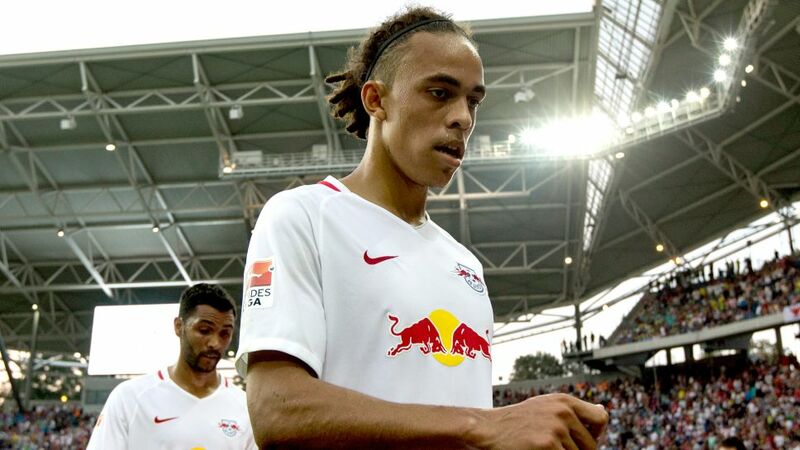 Although a striker by trade, Yussuf Poulsen does not need to be scoring regular goals to justify his place on the RB Leipzig team sheet. You can't go wrong with Yussuf Poulsen in your Official Fantasy Bundesliga ranks. Snap him up now! The Danish workhorse has played a starring role in the club's historic ascent of the German football ladder and remains an integral cog in the Leipzig machine in the Bundesliga, despite finding the net only once in nine top-flight appearances so far this term. "I can always run 11 kilometres per game," Poulsen told Mittedeutsche Zeitung recently. "I'm always using training to try different things out with my back to goal. Before I always used to focus on the ball, but now I try to guess the movement of opposition defenders." Poulsen's more refined approach can be attributed to two factors: the natural learning curve that comes with age and his club, Leipzig. The ambitious Saxony outfit have spent three years nurturing the Copenhagen native's talent, blooding him in the third tier and watching the 22-year-old grow, organically, into one of the most accomplished forwards in his age bracket. An ever-willing runner and an unflinching competitor, Poulsen has attempted more challenges than all but two of his Bundesliga contemporaries so far in 2016/17 - thoroughbred centre-backs very much included. He plays to the limit and only when his legs can no longer carry him does he even consider throwing in the towel. "I ran back 80 metres, then burst forward from halfway to the penalty box and then I wanted to press the opposition again," he recalled of one such occasion prior to his 89th-minute substitution in the 3-1 victory against SV Werder Bremen on Matchday 8. "I realised I had nothing left in the tank. It's a different level in the Bundesliga." Not that Poulsen or Bundesliga abecedarians Leipzig have looked even the slightest bit out of their depth among German football's elite. Ralph Hasenhüttl's troupe are unbeaten since gaining promotion as 2015/16 Bundesliga 2 runners-up, and go into their Matchday 10 assignment against 1. FSV Mainz 05 only two points behind defending champions FC Bayern München - in second place. "Now and again you stop and think: 'it's going better than expected'," Poulsen admitted. "We're new to the Bundesliga and we never said that we're aiming for a Champions League place. We want a trouble-free season. For that you probably need 40-50 points. Then we'll maybe set other objectives. We're keeping our feet on the ground." Poulsen's pragmatic assessment of Leipzig's Bundesliga fairy-tale is to be expected. TSG 1899 Hoffenheim were the most recent promoted club to set up camp at Mount Bundesliga's summit, scooping the nominal Herbstmeisterschaft in 2008/09, before sliding down to their final, albeit highly respectable, standing in seventh place.